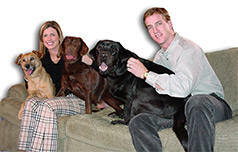 For years people have been asking us if DooDoo Voodoo is effective on stains as well as odors. We've generally shied away from making stain removal claims 'cause we didn't want people hating us if DooDoo Voodoo didn't fully remove their stains. We knew that we'd personally had incredible luck removing stains with DooDoo Voodoo, and that over the years people had reported total success at removing urine, vomit, feces, cranberry juice, grape juice and lots more. 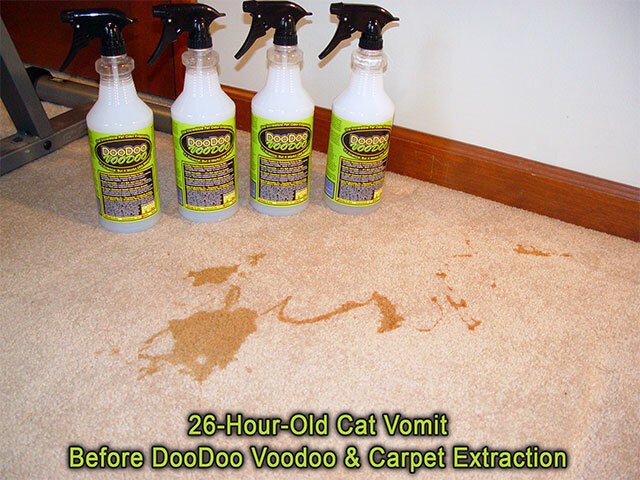 Well, we thought we'd strut our stuff a bit here and show you an example of how well DooDoo Voodoo can remove cat vomit staining. Sometimes she'd go over a day without vomiting, but that was rare. She'd typically vomit a few times a day. In between bouts of vomiting, she'd act totally normal and, aside from her feeding tube and shaved sides from her ultrasounds, you'd never know she wasn't absolutely healthy. Sorry to be so graphic, but some of the times she vomits, it was just foamy bile, which is typical of a kitty with pancreas/liver/spleen issues. Other times, though, she'd totally unload the food we've put through her abdominal feeding tube. She was being fed a couple special foods that are made for tube feeding, and they are quite dark and staining. We have light-colored carpet, so the staining was very pronounced. Today, I fired up our portable carpet extractor, the EDIC Bravo (shown here in a stock photo), which we now distribute and which is known in the carpet cleaning industry as a "spotter," meaning that its primary usage is to clean up smaller areas, not generally entire rooms (though we also sell tools that will allow you to use it for entire rooms; e-mail us). The Bravo is light enough for virtually anyone to carry and fits easily in any vehicle. It has way more suction than competing spotters, so it does a much better job of extracting and leaves your carpet drier than other units do. I use the unit with a DooDoo Voodoo Claw Tool (coming to the website soon). It's important to note that the Bravo unit only provides suction, not the agitation some carpet cleaning machines provide with their rotary bristles. (Agitation gets out a lot more than just suction. If you're interested in agitation in a truly professional machine, ask us about the EDIC Fivestar.) While our Bravo is pretty powerful, it's a small little thing that's meant to be carried from room to room, so it doesn't have nearly the oomph (called "water lift," which is a rating of suction) that a larger portable or a truck-mount machine would have. Still, the results I achieved with less than a quart of DooDoo Voodoo RTU and a few minutes' time were nothing short of amazing. I videotaped the cleaning session, narrating as I went, and am planning to post the video to our website in the future. For now, though, the two before and after pictures shown below will have to suffice. The pictures are absolutely unretouched and unaltered in any way except having the text added and being resized for the website. The difference in color between the two photos is due to a hitch in the automatic white balance of the camera I grabbed. Please excuse this slight mismatch, but I wanted the pictures to be absolutely unaltered in any way so you could see for yourself just how clean the carpet looked when I finished. I poured RTU DooDoo Voodoo on the vomit, then let it dwell for about three minutes, at which point I extracted it with our portable. This whole thing took me less than 5 minutes to perform...and with only suction from a portable, not agitation. The vomit had dried totally hard over the last 26 hours, so it wasn't as if I was just pulling up liquid. Even with that, there was no blotting, no scrubbing, nothing. Note that I did not use all the quarts of RTU (ready-to-use) DooDoo Voodoo shown in the picture; I only used less than one quart. If you buy DooDoo Voodoo Concentrate and add your own warm water, the quart of RTU would cost you as little as $0.39 depending on dilution ratio and which size Concentrate you buy. The carpet remained slightly moist with DooDoo Voodoo, which would negate any remaining staining (and odor) as the area dried. It would've been interesting to see what just DooDoo Voodoo alone would have done. We've used it alone on other urine, feces and vomit stains and, in a lot of cases, DooDoo Voodoo alone totally eradicated the stains. There was a lot of solid material associated with this cleanup, though, so extracting was necessary. For this project, I didn't do any subsurface extraction (learn more about our SOS subsurface tools on the PRODUCTS page and SUBSURFACE page), but some of you might need to if the organic material (vomit, blood, urine, feces, bile) has seeped down through your carpet backing and pad and into your subfloor, whether wood, tile or concrete. Not everyone needs subsurface extraction (the tools start at just $47.99 with free shipping), but it can be an absolute godsend. We hope you'll be impressed by these photos and will purchase some DooDoo Voodoo for yourself today. no guarantee is offered or should be inferred. In addition, I've put together a page dealing with the cleanup of the blood and blood clot Georgette once vomited. The page is in PDF format and is 384Kb in size. While it does show a couple blood stains, it's not really all that gross...and is a dramatic testimony (perhaps even more than the two photos above) to DooDoo Voodoo's stain-removal abilities. You can access the PDF document here. You can also find it on our DOWNLOADS page. You should also check out a page I put together to chronicle my Saturday project of cleaning up vomit, poop and pee left behind by our special-needs rescue dog, Rocky, who recently began having issues with his kidneys and developed a polyp in his bladder. Click to visit the Rocky Cleanup page. 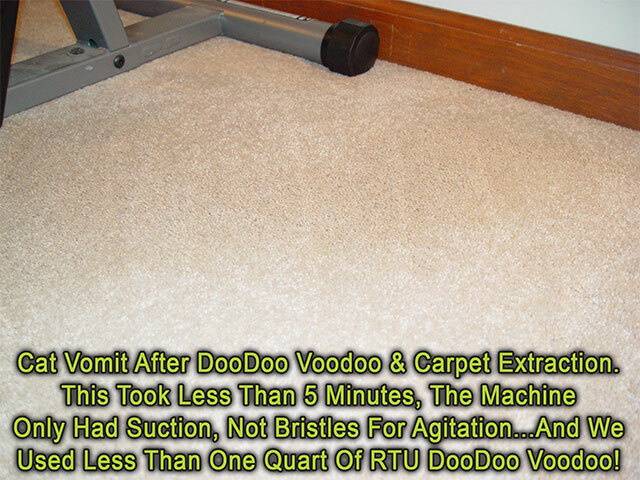 DooDoo Voodoo alone is phenomenal at removing stains and odors. 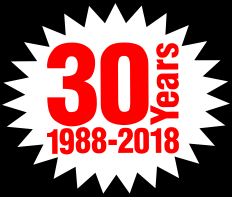 But, if your odor problems are more in-depth than you think you can tackle with just DooDoo Voodoo alone (meaning, your carpet backing, pad and subfloor are soaked with urine), boy do we now have good news for you! We're proud to now be distributors of some fantastic "subsurface extraction tools," which are specifically designed to pull impurities from not only your carpet fibers, but also your carpet backing, pad and even subfloor. You can learn more about these SOS Subsurface Extraction Tools on our PRODUCTS page (be sure to follow the Learn More link for tons more photos, case studies and tips) and on our Subsurface page. These tools provide the same functionality as pro-only tools (called Water Claws) that cost hundreds more. 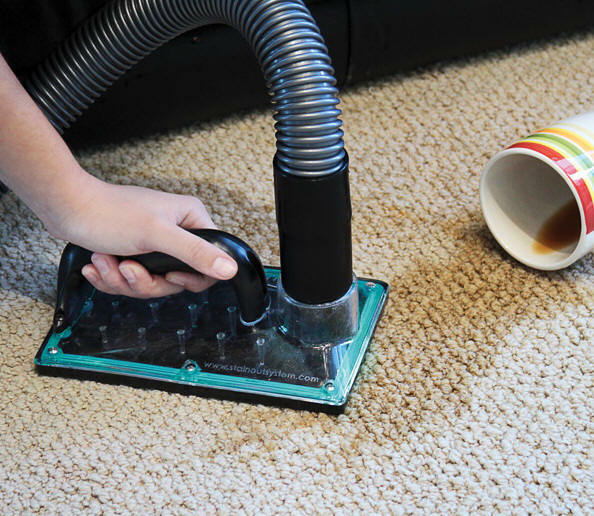 Even many professional carpet cleaners don't possess this level of specialized tooling, so for a very low investment (starting at just $47.99 with free shipping), you'll be performing pro-level odor and stain remediation yourself...and without even breaking a sweat. The tool does the work. I highly encourage you to learn more on the PRODUCTS page and to follow the link. Now, some of you won't have visible stains such as I've shown above and on the linked pages, so you'll need the help of a blacklight to ascertain where all your stains and odors are. We sell a fantastic blacklight that you can learn about and purchase on our PRODUCTS page. You can see a comparison of types of blacklights by visiting our BLACKLIGHT page. The short version: ours has the strength and the right wavelength of UV light to do a good job of showing you where the organic soiling is. If you've got stains, you may also have odors, including in your subfloor. 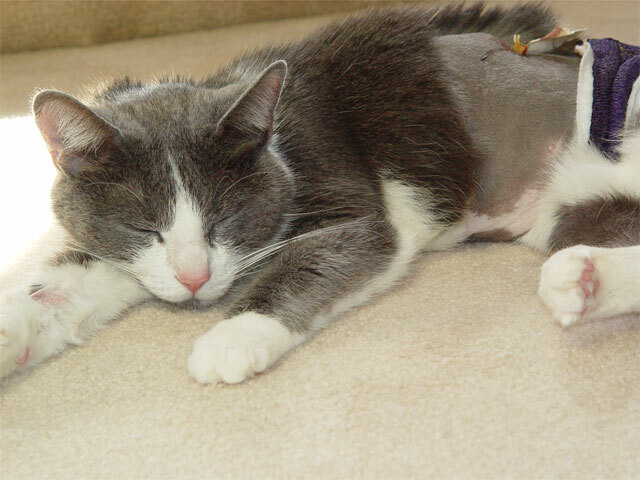 For info on how to deal with those types of issues, visit our Pet Urine Case Studies, Extraction Instructions and Salvaging Pee-Soaked Subfloor pages.